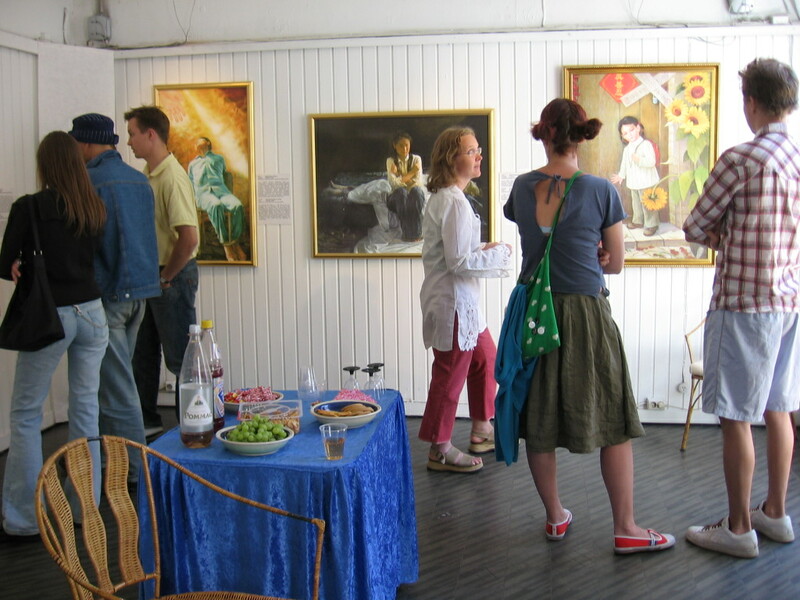 The second Truthfulness, Compassion, Forbearance International Art Exhibition was held in Galleria Oma Huone on Kalevankatu Street in the centre of Helsinki, capital of Finland. Near the gallery, practitioners distributed leaflets about the exhibition. In the gallery, practitioners guided people around conscientiously and patiently. A lot of Finnish people visited the exhibition, and it served as an opportunity for these people to find out about the truth of Falun Gong. 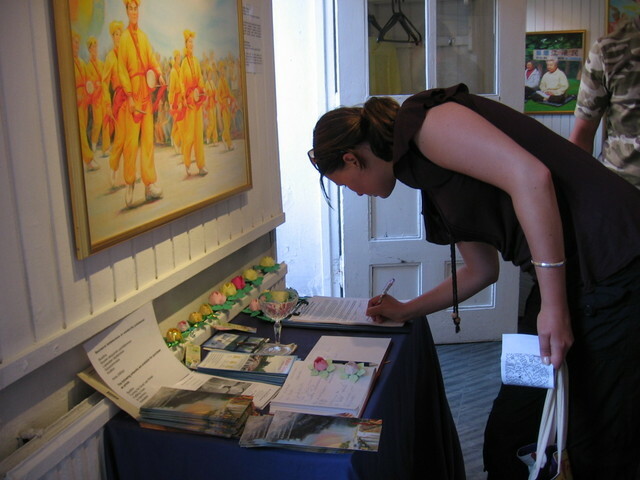 A lot of people signed their names to express support for Falun Gong after attending the exhibition. As well as taking leaflets about Falun Gong, a lot of people inquired about the exercises and the practice sites. A Turkish person, after appreciating all the paintings carefully, especially asked the practitioner who guided the tour to demonstrate the complete exercises of Falun Gong. Then he said it was fabulous and that he would tell his friends to come to the exhibition. 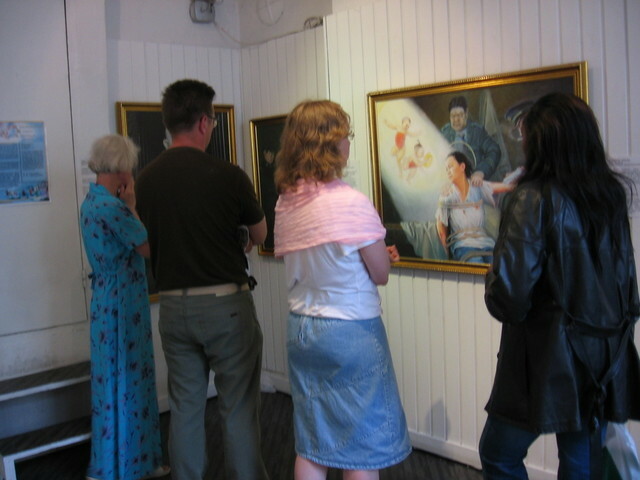 While seeing the paintings "Forced Feeding" and "Giving a Poisonous Injection" which depicted the persecution of Falun Gong practitioners by the Chinese Communist Party (CCP),three ladies heard that Falun Gong practitioners were forced to engage in long term, hard manual labour and produce products for export in the CCP's labour re-education camps. One of them said right away, "There are many cheap Chinese products in Finland, now I understand why. I will refuse to buy the products by slave labour in China." Several people could not help shedding tears while seeing the miserable state of the children of Falun Gong practitioners that were being persecuted in the painting, "homeless." A lady among them said she would like to adopt Falun Gong practitioners' orphans. Worrying for the "Homeless Girl" Looking at the painting "Giving a Poisonous Injection"